This past weekend, I had a dripping faucet and I had to call a plumber to have it fixed. A plumber is a person whose job is to fit and repair water pipes. If your kitchen faucet is leaking or your toilet is clogged, a plumber is the person to call. Now, that aside, here’s a quiz for you. 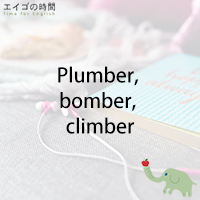 What do the words plumber, bomber, climber, debt, doubt, subtle have in common? The answer is that they all have a silent b in them. Silent letters are letters that you can’t hear when you say the word, but that are there when you write the word. For example, a plumber. Do you know how to spell it? It’s P-L-U-M-B-E-R, you see the letter B in it. But when you say the word “plumber”, there’s no B sound in it. The letter B just sits between M and E silently. Now, here’s another quiz for you. What five-letter word has a silent CH? I’ll give you the answer next week. So please make sure to come back. See you there!